I have a mysterious fascination with this type of doll. I have even gone as far as cutting two moulded porcelain dolls at the soft slip stage and sticking them together to create my own porcelain version. I think that this must have all started by my seeing one in the Worthing Museum when I was a small child even though I cannot precisely recall it. As a child I am not sure I would have been so keen to play with such a doll - I liked realistic dolls rather than novelty items. However, it left a lasting impression on me, and here is knitted version for you to try. This design has two completely different dolls with different dresses - sometimes you even find Red Riding Hood and the Wolf in topsy-turvy form though I find that a bit horrific. 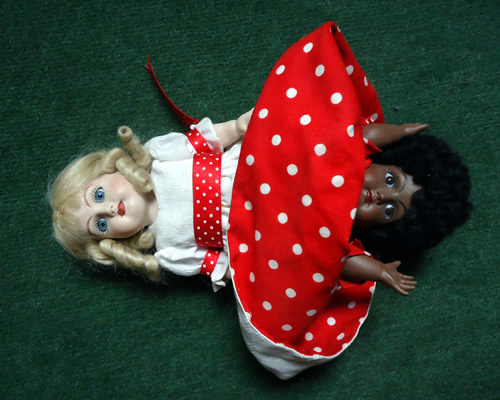 However, I quite like the complete negative effect as I made for my bisque doll - one dress in white with red spots, and the other red with white spots - if that appealed then you could easily adapt this pattern by reversing the spot colour dress colours. With 3¼ mm needles and yarn used double, cast on 31 sts. Beginning with a knit row, work 20 rows in stocking stitch. Cast off 4 sts at the beginning of the next 4 rows [15sts]. Work 26 rows in stocking stitch. Next row: (k2tog) twice, k7, (k2tog) twice. Next row: (p2tog) twice, p3, (p2tog) twice. Next row: Sl1, p12. Turn. Next row: Sl1, p13. Turn. Cont thus, working one extra stitch on each row until all stitches are worked. Increase one stitch at each end of the next row. Complete as for back from *** to end. With 3¼ mm needles and yarn used double, cast on 12 stitches. Beginning with a knit row, cont in stocking stitch. Increase one stitch at each end of the 3rd and 5th rows [16 sts]. With right sides together, join body and head, leaving bottom open. Join dolls together round waist, putting in more stuffing if needed. Join arms at sides. Stuff end of hand flat, then stuff remainder. Stitch across tops, then stitch across shoulder, making middle of arm at shoulder seams - arms should drop both ways. Tie yarn round wrists, and stitch 3 lines to mark fingers, and down the shaping for thumb. On cream doll work eyebrows and eye shape in small back-stitch, using brown. Work blue satin stitch for eyes, with a black stitch in the centre. Mark cheeks using rouge or blusher (or embroider if preferred). 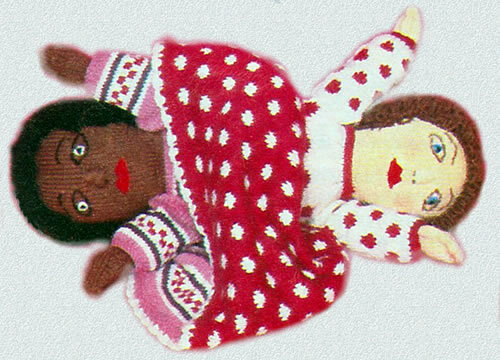 On brown doll use black instead of brown and work in white round the eyes. Work noses in self-colour satin-stitch, starting at top with small stitches, and getting larger, with 2 black dots for nostrils. For cream doll, use single brown yarn. With 3¾ mm needles cast on 22 stitches. 2nd row: K1; * work loop stitch thus:- insert needle into next stitch knitways; with first finger of left hand under point of right needle wind yarn round finger and needle twice, then round needle once more, draw all loops through stitch and slip them on to left needle, knit together all loops and the stitch and slip off needle together, repeat from * to last stitch, k1. 5th row: As 1st row, increasing one stitch at each end. Next row: k1; (loop stitch, k2tog) 9 times. Join cast-on edge to top of face. Fold cast-off edge and join, then shape hair round face and stitch round face and back of head. For brown doll, work hair in same way, using black yarn double and 3¾ mm needles. With 3¾ mm Twin Pin (circular needle) and red (R), cast on 202 stitches. Knit 5 rows, then purl one row. 1st row: Knit 4R, * 2W, 6R, repeat from * to last 6 stitches, 2W, 4R. 2nd row: Purl 3R, 4W, * 4R, 4W, rep from * to lastitch 3 stitches, 3R. 3rd row: Knit 3R, 4W, * 4R, 4W, rep from * to lastitch 3 stitches, 3R. 4th row: Purl 4R, * 2W, 6R, repeat from * to last 6 stitches, 2W, 4R. 5th to 8th row: Work in R.
9th row: * Knit 2W, 6R, repeat from * to last 2 stitches, 2W. 10th row: Purl 3W, 4R, * 4W, 4R, repeat from * to last 3 stitches, 3W. 11th row: Knit 3W, 4R, * 4W, 4R, repeat from * to last 3 stitches, 3W. 12th row: * Purl 2W, 6R, repeat from * to last 2 stitches, 2W. 13th to 16th row: Work in R.
Repeat these 16 rows 4 times more, then first 14 rows again. Change to 3¼ mm needles. Knit 4 rows. Cast off. With 3¼ mm needles and R, cast on 22 stitches. Knit 4 rows. Join in white (W). Change to 3¾ mm needles. Beginning with purl row, work 3 rows stocking stitch. 5th to 8th row: Work in white in stocking stitch. 13th to 16th row: Work in white in stocking stitch. Repeat the 16 rows of pattern once more. Break off red and continue in white only. Cast off 5 stitches at the beginning of the next 2 rows. Leave remaining 34 stitches on a spare needle. With 3¾ mm needles and W, cast on 82 stitches. Knit 4 rows. 5th row: Knit 2W, yfd, k2togW, 4W, 2R, * 6W, 2R, repeat from * to lastitch 8 stitches, 8W. 6th row:-Knit 5W, then purl 2W, 4R, * 4W, 4R, repeat from * to last 7 stitches, purl 2W, knit 5W. 7th row: Knit 7W, 4R, * 4W, 4W, repeat from * to last 7 stitches, knit 7W. 9th to 12th row: - With white, work in stocking stitch. 13th row: Knit 2W, yfd, k2togW, 1W, 1R, * 6W, 2R, repeat from * to last 12 stitches, 6W, 1R, 5W. 16th row:-Knit 5 B, then purl 1R, 6W, 2R, 3W, with W cast off next 10 stitches, weaving R loosely across stitches; then with 1 white stitch on needle after casting off, purl 2R, * 6W, 2R, repeat from * twice more, purl 1W, cast off 10 sts as before, purl 3W including stitch on needle, 2R, 6W, 1R, knit 5W. Break off red. Leave stitches on spare needle. 1st row (wrong side facing): Knit 5, purl to last 5 stitches, k5. 3rd and every alternate row: Knit 5, purl to last 5 stitches, k5. 13th row: Knit 5, purl to last 5 stitches, k5. Break off white and work last rows in red. 14th row: In red (R) k2, yfd, k2tog, knit to end. With 3¾ mm Twin Pin (circular needle) and lilac (L), cast on 202 stitches. Knit 5 rows. Beginning with a purl row, work 3 rows stocking stitch. 11th to 16th row: As 1st to 6th rows. Rep these 26 rows twice more, then rep the 1st to 16th rows again. Continue with lilac (L) only, breaking off other colours. With 3¼ mm needles and lilac (L), cast on 23 stitches. Knit 4 rows. Change to 3¾ mm needles. Work 1st to 16th rows of skirt pattern; decrease one stitch at each end of the last row [44 sts]. Break off colours, and continue working in lilac (L) only. Work 20 rows stocking stitch. Cast off 5 sts at the beginning of the next 2 rows. Leave the remaining 34 sts on a spare needle. With 3¾ mm needles and lilac (L), cast on 82 stitches. Knit 4 rows. Continue using lilac only and work exactly as you did for the first dress, keeping the garter stitch border correct. 5th row: Knit 5, purl to last 5 stitches, k5. 7th row: Knit 5, purl to last 5 stitches, k5. 9th row (in white): Knit 5, purl to last 5 stitches, k5. 11th row (in claret): Knit 5, purl to last 5 stitches, k5. 13th row (in white): Knit 5, purl to last 5 stitches, k5. K 4 rows. Cast off. Join sleeves of spot dress up to cast-off edges. Join cast-off edges to cast-off edges on bodice. Sew on buttons to match buttonholes. Join bottom of bodice to waist of doll. Make top of stripe dress the same and join at waist, meeting other top. Join back seams of skirts. Put both skirts on to doll and join to tops at waistline. Starting at back seam, with crochet hook and white, work * 1 dc through bottom edges of dresses, working through both skirts at once, miss 1 stitch, 3 tr into next st. miss 1 st, rep from * to end. Dolls: 3 x 50g brown, 2 x 50g cream, 1 x 50g black and small amounts of blue and white for eyes and red for mouths. Dresses: 3 x 50g in each of white and red, 2 x 50g in lilac, and 1 x 50g in claret. 3¾ mm Twin-Pin, 60 cm, (24 inches), long. 22 sts x 28 rows to 10 centimetres, (4 inches), measured over stocking stitch, using 3¾ mm needles. m1:- make a stitch by picking up loop lying before next stitch and work into back of it. yfd: yarn forward; bring the yarn to the front of the work and pass it over the needle when knitting the next stitch; makes an extra stitch which forms a small pattern hole when knitted on the next row. Robin Reward was a nylon budget double knitting. You can buy a Robin double knitting today, 100% acrylic in 100g balls at very low cost. Its wide colour range, robust qualities, and reasonable price could make it very suitable for hard working toys. Robin Premium Acrylic is also available in 25g balls which is useful for making toys. My porcelain version of a topsy turvy doll.